I've purchased an induction hob from Currys, booked installation for it, and a washing machine. The fitters have said that they are not allowed to fit the hob, because its above a cutlery drawer (which is quite deep I might add) and has already a decent gap to the bottom of the existing ceramic hob. He said there needs to be a thermal plate between the drawer and the hob. He did say that they were putting a washing machine into another house yesterday, and the home owner had an electrician there fitting an induction hob above a cutlery drawer and he said it was no problem. Everything I read online by people posting says they've done it without problem. So, do any of you have an induction hob above a cutlery drawer? I'm currently trying to call kitchen fitting companies, but they're all busy. Last edited by urban; 13 September 2018 at 02:34 PM. Seems a bit odd as an induction hob creates the heat by electro magnetically heating the pan, so the hob itself only gets hot as a result of the pan being hot, it doesn't generate any heat itself. If he means something to stop it somehow heating the cutlery through magnetism, it seems unlikely as they all protection for the electrics of the hob itself, so it certainly isn't going to do anything with your cutlery! A quick search on t'internet shows loads of people happily using them above cutlery drawers without issue! I said to him, why didn't they tell me this the fecking shop, he replied by saying they don't have a clue, but company policy is he's not allowed to fit it. I rang a local kitchen company, they said they've fitted hundreds of the things through the electrician they use. He said that if there is going to be any heat, it would be from the fans, but he has only every had one issue with heat, and they solved that by putting in a divider. 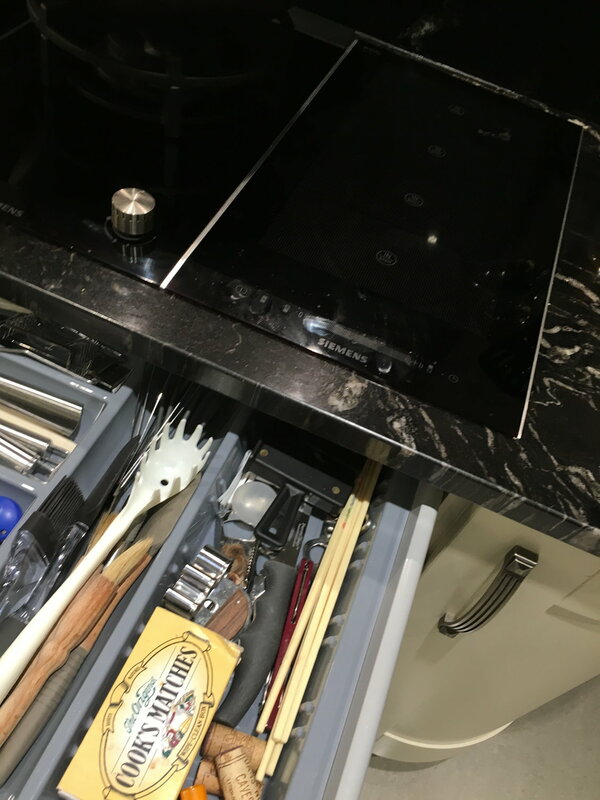 They put me in contact with their electrician, and he said he would love to know why these can't be fitted above cutlery drawers as he does it all the time. Last edited by urban; 13 September 2018 at 03:10 PM. Induction hobs use electro magnetic induction to transfer the energy to a ferrous material (pan) placed on (or near to) the inductive source - this results in the ferrous material heating up. The induction is achieved using a coil of wire, which when you pass an electric current through it, generates a magnetic field. You should remember from your high school science classes, magnetic fields try to connect in circles from (north to south). The coil is aligned in the hob, such that the magnetic field travels vertically, so that means it goes both upwards and downwards from the cooking hob. The more current you pass through the coil, the larger and more powerful the the field and the more energy will be transferred as heat into the pan. This is a more energy efficient way of heating the pan than a conventional heating element which relies on heat conduction which has greater losses. It also has the advantages that you can more quickly regulate the heat (comparable to cooking with gas) and the cooking surface itself (as a non ferrous material) is not heated by induction (although will still be heated from conductive heat transfer from the pan back to the surface!). The big disadvantage is you need ferrous metal pans for it to work, so if you have any copper, aluminium, glass or ceramic pots for example, they're not going to work, although you can get heating plates to put between the hob and the pot, but you loose the efficiency and ability to quickly vary the temperature. So, if you have ferrous metal objects (e.g. stainless steel cutlery) directly below, they may also be subject to the electromagnetic field and therefore be heated. The big question is the effective field size of the hob and how far below the hob the cutlery is stored. If they are far enough away, they may not be affected or perhaps lightly warmed, but if they're too close, they could of course get extremely hot and cause burning if you touch them, not to mention pose a fire risk. By installing a "thermal plate" as the installer puts it, the idea is to shield or block the magnetic field from propagating below the hob and heating any metal objects below. Some manufacturers may install such shields as standard, others may not and will rely on you having a minimum distance from the bottom of the hob to any ferrous metal objects. I tried contacting Samsung - what a waste of 30 mins that was, you get some tool referring you to a manual. Their recommendation is this, a drawer should not be below the hob. However, its it perfectly find to have an over below the hob, so long as there is a divider which is 20mm below the hob. The drawer I have would mean the cutlery probably would be 25-30 mm from the bottom of the hob, but the fella with the name that you can't pronounce, says no in the best pigeon English that he can manage to string together. "Its is not being recommended to do this"
To be fair to the Currys installation guy, he said the plate is to make sure that I can't touch the bottom of the hob when reaching into the drawer. To touch the bottom of the existing hob would mean having to twist your arm, so that the palm faces upwards, then you've have to purposely feed your hand into the drawer which would need to be partially opened in order to try to touch it. So you're being a bit of a tool if you really wanted to do that. Last edited by urban; 13 September 2018 at 03:56 PM. I just measured the cutlery distance. My estimate was wrong on the distance. Should probably be fine provided its not stuffed full of all sorts. Curry's policy is probably based on avoiding any litigation. If they install it, then a customer burns themselves on a super-heated spoon, then Curry's would be liable for damages. As a big company, their lawyers have probably done a risk assessment and introduced the policy, even if its an overkill. A small independent kitchen supplier probably hasn't even thought about it, and having installed hundreds of kitchens and never had a problem, most likely don't understand why Curry's won't do it! Having done more reading, it seems that its not just Samsung saying no induction hob over cutlery drawer. Best thing to do is to read (or download if not supplied) the installation manual...this is available online for Bosch/Siemens/NEFF and I'm pretty certain that nothing about this was mentioned in the manuals for mine (Siemens domino), As I did check because I had granite worktops which are thinner than melamine. Last edited by ALi-B; 13 September 2018 at 09:28 PM. Yep, just read manual...says above drawer is fine but warns that the cooling fan will heat up metal utensils. It must also have a air gap behind the kitchen unit for airflow. It cannot be fitted above a fridge or freezer or ovens without a cavity ventilation fan. Last edited by ALi-B; 13 September 2018 at 09:25 PM. Cables from electrical appliances must not touch the hot surface of the hob or cookware. In fairness it does say drawers may not be fitted underneath on page 16. Maybe I should just take the entire thing back to the bloody shop. Hmm Typically Samsung...no reason as to why And a FRONT ventilation gap? That's going to look ugly, I was under the impression most are vented via the rear of the kitchen unit. Right hand side of page 5. Just says 65mm gap from top required and 20mm gap from the wall. It does mention the use of a spacer shelf above a drawer if heat is a issue (Figure 6). So maybe swap it for a hob with more useful instructions and more flexible installation options. I'm not one to ***** wave, but I noted the Samsung puts out 2.6Kw...Mine is 3.2Kw (albeit only on the centre without anything else on), it actually boils water faster than our old electric kettle, so we use a stove top kettle now. Something to keep in mind if the government decides to ban fast-boil kettles. Last edited by ALi-B; 13 September 2018 at 10:24 PM. Exactly, I contacted them to ask why - not a ******* clue, waste of a 25/30 minute attempt. Plus, lets face it, there will be no front vent gap, considering this is replacing a broken ceramic hob. Last edited by urban; 13 September 2018 at 10:27 PM. I suspect companies won't want to publicise that induction heats ferrous materials both upwards and downwards, this could cause the public to unduely fear the technology as the average person doesn't understand it. Its easiest just to say you need a gap for cooling purposes and leave it at that. What you don't know can't hurt you! Yep. Once rang them to find out if a TV bought in the UK would defo work in France. (I now know it would, but this was fifteen years ago). Their response was, "We cannot uphold the warranty if you buy in the UK and take the TV to France." Quite apart from that not even being my question, they refused to deviate from that answer. TBH, I no longer buy Samsung because of their [email protected] customer service, unless no-one else does the same. I now have a Sony phone and LG TV's. Ditto, except our Bosch has been in for 3 years. I’ve never had any problem with hot or even warm cutlery in that time. My thinking is two fold, Samsung say it can't be fitted above the drawer, and secondly if something went faulty with it, I would imagine I would be told it was fitted incorrectly and warranty would be null. Last edited by urban; 14 September 2018 at 11:42 AM. Mine doesnt superheat metal items, they get warm if the hob's been on for 20mins plus, but there is a fan blowing hot air under there. Nothing gets too hot to touch/burn. I guess there is some sort of shielding, otherwise my bottle opener would have melted through the tray! Maybe cheaper/lower quality models don't have any shielding? There is also a issue that paper or tissue could get sucked into the fan; I since found an addendum for mine warning of this. Last edited by ALi-B; 14 September 2018 at 01:46 PM. I think you've answered your own question: Take it back and get another Neff! (or Siemens, or Bosch...they are the same underneath). Last edited by ALi-B; 14 September 2018 at 06:00 PM. Ceramic Hobs - any recommendations ? What Induction Kit Gives the Best Induction Roar ? Oh my god ... really!